If this was a certain former bakery on St. Mark's Place, it would be called Bait & Switch. 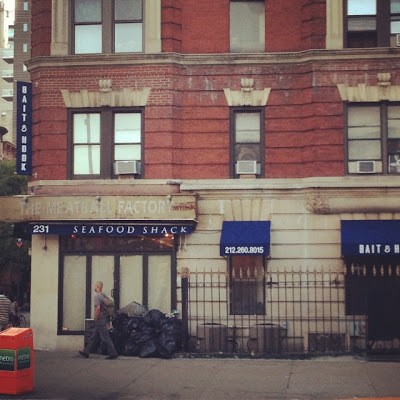 I read the headline as "Meatball Shop" and I almost had a heart attack. That's it, one more restaurant with a douchey apostropheyed name and i'm REALLY gonna lose it! That signage does not convey "shack", maybe it's seafood chic and it's spelled wrong? If the owners of this place completely ignore the noise and other concerns of their neighbor residents. The we will make sure all potential customers know that they are to avoided as people who don't care about any thing but themselves. If we cant sleep work or study because of their constant noisy systems that can be easily fixed then we will stand on the corners and keep customers away . It wasn't just poor management that killed Meatball Factory it was their lack of concern for their removal of the quiet enjoyment of our domiciles . Hook and Bait appears to have the same forget about neighbors attitude. If you must eat here please ask them to move the noisy venting system .In fact offering to donate so they can afford the 1000 dollars or less to move vent. Communications have improved there is some quality response from the management and the noise complaints will be addressed to the best of their abilty. THe neighbor residents are hopeful ! Good luck Bait and Hook Please patronize so they have the funds needed to continue be a Good neighbor!! Please do not patronize. They have been lying to me about their concern for their neighbors quiet enjoyment of their homes. This quiet is removed by their exhaust fan. This can be moved to a better much less noisy position. Their employees have witnessed the noise and even commented on how noisy it was. They said they would fix it . That was 2 weeks ago now they have done nothing and seem like they don't want to or care. There are better fish places in the neighbor hood Mollys on 3rd Ave and 22 street has the best Fish and Chips. www.MollysShebeen.com There is also a great japanese place www.Kanoyama.com with sushi and great cooked seafood.. at 2nd Ave and 12th street Their fried rock shrimp is the best. They don,t disturb neighbors. So please go to the better places and if you must go to Bait And Hook please tell them to be good neighbors and stop disturbing the two buildings full apartments with their noise from their kitchen vent .Ask them to spend some change to move it out of line of sight of 20 bedroom windows plus living spaces too. Was really looking forward to enjoying tasty fried clams but all we tasted was the overpowering batter. Couldn't taste the clam inside at all. Pizza, chowder were decent. Nothing any of us ordered would make us rush to return." Just head over to the KFC across the street. You've been warned." Came here with some friends after class and the experience was mediocre. Food was alright. I ordered the clam chowder as a starter and shared the Fish & Chips and Chorizo Pizza with my friends. The clam chowder was standard, and nothing special, to be honest. The Fish & Chips were prepared well, but again, not anything special. The pizza was interesting and something different, however it did not taste that good. Service was not that great either since we had to literally walk up to the bar in order to get some attention. "I was really looking forward to trying this restaurant and was extremely disappointed. Overall the food was okay, we had some oysters, fried clam bellies, the lobster roll, the scallop roll, corn on the cob and brussel sprouts. The lobster roll was definitely smaller than most places, the scallop roll a bit too oily, and the corn was not fresh. The clams were the highlight of the meal but I find that most places can't screw up fried food. What truly made this experience awful though was the service. I am typically very understanding that new restaurants still need to work out some issues but this was one of the most annoying dining experience I have ever had. We had to ask our bus boy multiple times to find our waiter, which is surprising as the restaurant is not very big. Our appetizers went to the wrong table twice and that table happened to be friends with the owners. It took about 10 mins for them to get our beverages and then another 10 min when we ordered another glass of wine. They kept the back door open and the same friends kept using that door to go outside and smoke, which of course was blowing back into the restaurant. Considering this restaurant is located on 14th st, just imagine what could possibly crawl in. Part of me wanted to give this restaurant 2 stars since it is new and they did comp us part of our meal but I could never recommend this place to anyone".